Published: June 1st, 2018 by Simon. Filed in Kitchen and tagged ceramic tiles, porcelain tiles, timber flooring. Renovating a kitchen involves much more than replacing your kitchen cabinets, benchtop, and splashback. More often than not, it also involves replacing the existing flooring, amongst other things. In fact, according to Houzz’s 2018 Australia Kitchen Trends Study, 66% of kitchen renovators chose to update their flooring last year. If you’re planning to renovate your kitchen, then statistics show that there’s a good chance you too will update your flooring in the process. But before start looking for kitchen flooring in Perth, you should know a little about your options. There are several types of flooring options available today. From laminates to cork, vinyl to carpets, hardwoods, stone, marble and ceramic and porcelain tiles, your choices are endless. However, according to the study, the most popular flooring options with Australian homeowners are hardwood, tiles and engineered wood. Most homeowners who renovated their kitchens last year upgraded to one of these three types of flooring. Today, I thought I’d take this opportunity to tell you a little more about these three flooring options. So, continue reading this post as I discuss these three types of flooring. By the time you’re done the reading, you’ll know which flooring type to go with. Wood is often considered to be not a good choice for use on kitchen floors. After all, kitchens are messy, and hardwood is an expensive flooring option. However, this is not true at all. As a matter of fact, hardwood works great on kitchen floors, and it is also the most popular flooring choice. The study reports that hardwood flooring was the most popular kitchen flooring choice with renovators last year – 32% of kitchen renovators upgraded to stained or unstained hardwood flooring. Hardwood flooring is all about sophisticated and refined looks. Not only is it modern and attractive, but it also offers a natural look and a warm texture. 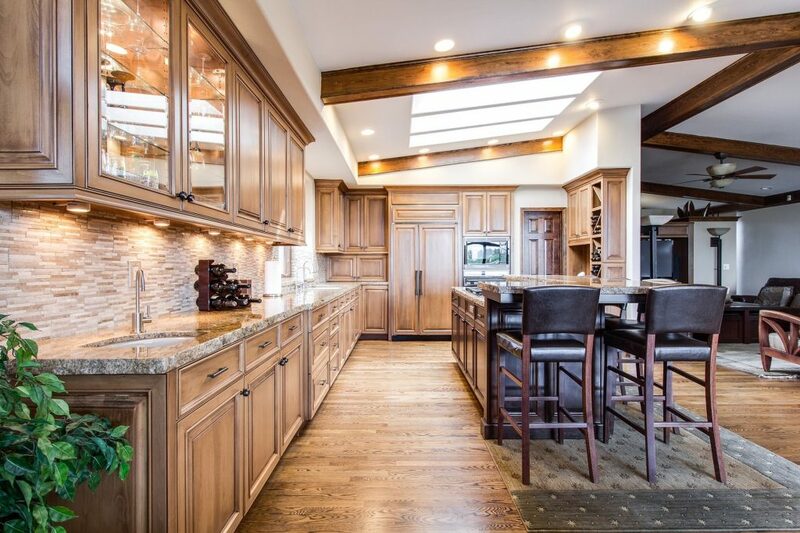 Hardwood can bring the ‘wow factor’ to an otherwise ordinary looking kitchen. While hardwood certainly offers attractive looks, it does requires a good amount of maintenance. It also tends to expand and contract with changing temperatures and excessive moisture. As kitchens are prone to changing temperatures and high moisture, hardwood must be sealed for use in kitchen floors. If you want to go with hardwood flooring in Perth for your kitchen, do so. But just make sure that it is well sealed to withstand expansions and contractions. Also, make sure to choose flooring that is not pre-finished but rather finished on-site. The advantage of on-site finishing is that there will be a layer of sealant covering the gap between boards – this will prevent moisture from seeping into the gaps and will consequently prevent expansions and contractions. Remember – with hardwood flooring for kitchens; you will always need to maintain it. While hardwood is durable and resilient, without proper finishing or sealing, it will create problems for you. Also, keep in mind that hardwood is the most expensive flooring option of the top three types of kitchen flooring. Ceramic and porcelain tiles are the second most popular kitchen flooring choice with homeowners in Australia. According to Houzz’s study, 18% of kitchen renovators upgraded their flooring to ceramic or porcelain tiles last year. Ceramic or porcelain tiles are an excellent choice for kitchen floors, and in my opinion, the best choice. They are extremely durable and hardwearing, they are water resistant, and they require little maintenance. Moreover, ceramic and porcelain tiles are available in an endless choice of designs, styles, colours and finish options. In fact, several ceramic and porcelain tiles are also designed to mimic the look of natural substances such as marble or hardwood, therefore allowing you the best of both materials. Another big reason why people choose ceramic or porcelain tiles for their kitchen floors is affordability. Ceramic and porcelain tiles are far more affordable than natural stone, hardwood and even engineered wood. As such, tiles are a very cost-effective and practical choice for use in bathrooms and kitchens, as well as other areas of a home. While ceramic and porcelain tiles offer several advantages, they do suffer from a few drawbacks. Tile surfaces are prone to cracking if heavy objects are dropped on them. Tiles also reflect sound, so using them in your kitchen will contribute to a noisier environment. And, the tile surfaces may also become slippery when wet. If you’d like to choose ceramic or porcelain tiles for kitchen flooring in Perth, look no further than us at Ross’s Discount Home Centre. We’re Perth’s largest retailer of ceramic and porcelain tiles. We offer a full range of tiles that are ideal for use on kitchen floors. Our tiles are available in a plethora of designs, finish options, and colours, allowing you to create the kitchen of your dreams. We even offer wall tiles which complement our floor tiles. If you’re looking to create a kitchen splashback or feature wall, you’ll find everything you need at our store. Go ahead and take a look at our collection of ceramic tiles and porcelain tiles. If you’d like to see the tiles in person, please feel free to pay us a visit in Guildford. Our tiles are in stock and ready to dispatch. 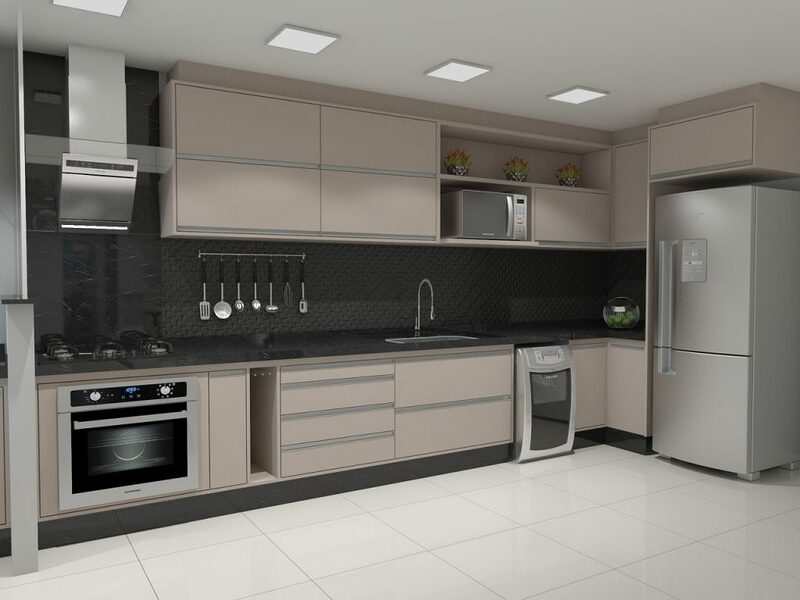 By choosing us, you can start with your kitchen renovation immediately. Finally, the third most popular choice for kitchen flooring in Australia is engineered wood. The Houzz study found that 14% of kitchen renovators upgraded their flooring to engineered wood last year. 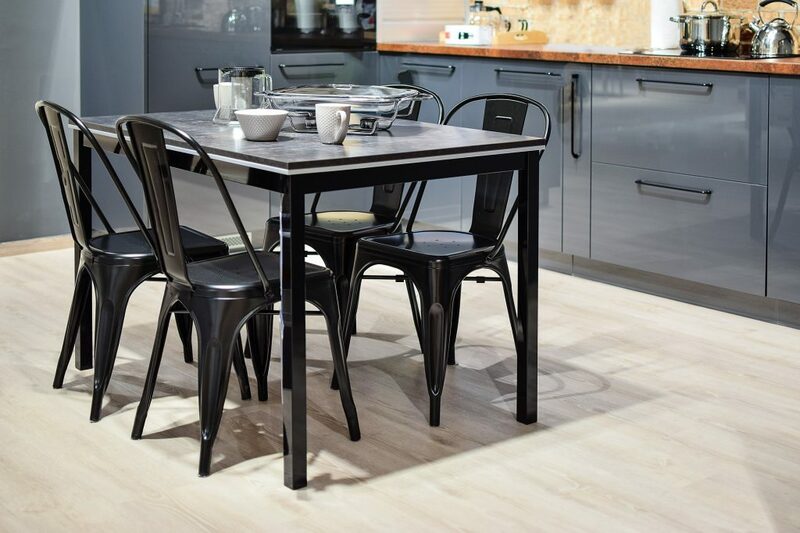 The study shows that engineered wood is obviously a good flooring choice for kitchens, but why? Well, the fact that is designed to offer the classic look and feel of hardwood, but without many of the drawbacks that hardwood offers is one of the main reasons. Engineered wood is made out of several different layers including a veneer, plywood, high-density fibreboard and sometimes even hardwood. The use of multiple layers makes this flooring option stable while the veneer adds authenticity and beauty to it. And unlike hardwood, engineered wood faces no expansion or contraction problems with changing temperatures or excess humidity. It also requires little to no maintenance, and it will not warp, swell or lose its shape. There’s also an environmental benefit to choosing engineered wood over hardwood. Hardwood trees grow very slowly as compared to the trees used to make engineered wood. By choosing engineered wood flooring, you’re actually helping the environment. Another point worth mentioning is that engineered wood flooring is very easy to install. If you go with engineered wood and you have some experience with DIY projects, you won’t need to hire professionals for installation. While these advantages may make you think that engineered wood is the ideal flooring choice, there are some problems with it. While engineered wood is certainly cheaper than hardwood, it is still far more expensive than tiles, laminates and other flooring options. Also, for engineered wood to be of good quality, the core layers must be made from high-quality wood, preferably hardwood. This can increase the cost of flooring significantly. If the veneer on engineered wood is too thin, the flooring will prematurely fade and lose its charm. Veneer also prevents refinishing and sanding opportunities. Whether you should choose engineered wood for kitchen flooring in Perth, completely depends on your preferences and your budget. High quality engineered wood does look as good as hardwood, but it is also expensive. If budget is a constraint for you and you really want a natural look in your space, consider timber-look tiles over both hardwood and engineered wood. Our timber-look tiles here at Ross’s Discount Home Centre are far cheaper than engineered wood, and they completely replicate the look of natural hardwood. They make the perfect choice for use in your kitchen flooring in Perth. There may be several types of flooring types which are suitable for use in kitchens. However, the top 3 kitchen flooring options here in Australia are hardwood, ceramic or porcelain tiles and engineered wood. Hardwood is by far the most popular choice for kitchen floors. But, it is also one of the most expensive flooring types, and it requires heavy maintenance. Ceramic or porcelain tiles, on the other hand, are a much more practical choice. They are affordable, and they require low maintenance. They are also available in an endless choice of colours and designs which allow you to design your kitchen just the way you want. Engineered wood is the third most popular choice for kitchen floors with Australian homeowners. This option is designed to offer the look of hardwood, minus the maintenance requirements. However like hardwood, high quality engineered wood is also quite expensive. And like hardwood, engineered wood is also prone to be affected by fluctuating temperatures. At the end of the day, the type of flooring you choose will depend on your budget and your preferences. If you’re a practical person who values your hard-earned money, go with ceramic or porcelain tiles. This option will offer you the best value for your money and will guarantee you’re left with an attractive kitchen. If you agree and haven’t yet bought tiles for your kitchen, then we can help. Ross’s Discount Home Centre has the biggest collection of ceramic tiles and porcelain tiles in Perth, all available at very affordable prices. Simply, drop by our showroom in Guildford or shop online to get your tiles today!